I have been keeping up with the 52 Ancestors in 52 Weeks writing challenge from blogger Amy Crow Johnson of No Story Too Small, and often using her optional themes. 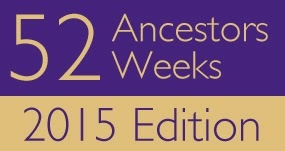 I liked last week's theme ("32" third great-grandparents) so much that I will continue to write about a third great-grandparent if the optional theme doesn't work for me. 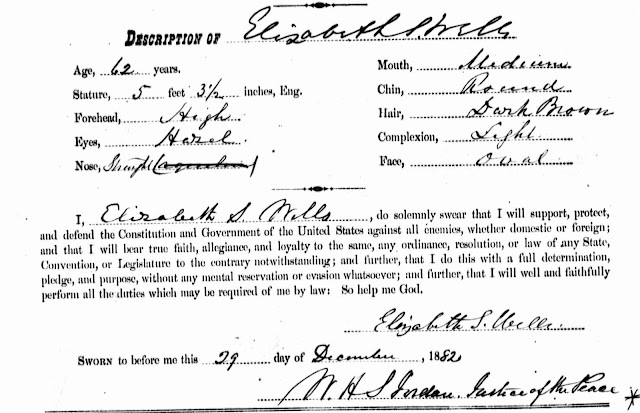 Third great-grandmother, Elizabeth Sewall Willis, was born in Portland, Maine, on September 12, 1820, to Benjamin Willis and Elizabeth Sewall May. She was their second child; her older brother was Hamilton Willis. Sadly, her mother died when she was two years old, supposedly after the birth of a third child, who did not survive. It doesn't appear that her father remarried. Her grandfather was Joseph May and her first cousin was Louisa May Alcott. Her daughter, Eliza May Wells, married Elizabeth's first cousin (Eliza's first cousin once removed), Samuel Sewall Greeley. As I have noted before, this family gets confusing because there are so many in different generations and different branches with the same names: Eliza/Elizabeth, Louisa, Ruth, Benjamin, Thomas. An 1882 passport application (from Ancestry.com's U.S. Passport Applications, 1795-1925) confirms her birth date and birth place (as she reported it), as well as provides me with a physical description and her signature. Here she reported that she was born in Portland, Maine on September 12, 1820, and that she is planning to travel abroad with her youngest daughter Ruth. Further down is the description of the 62-year-old widow as 5 feet 3 1/2 inches tall with a high forehead, hazel eyes (my mother has hazel eyes...), a straight nose, medium mouth, round chin, dark brown hair, light complexion, and oval face. Toward the bottom you see her signature. The residence of her husband at his death in 1873 was 81 Pinckney Street in Boston, which is across from Louisburg Square on Beacon Hill, a very nice address now and then. She was still living at 81 Pinckney Street at the time of the 1900 U.S. Census, with daughters, Louisa Wendte (a widow) and Ruth Wells, a granddaughter, Frederika Wendte, a companion, and two servants. She died on August 8, 1900, and is buried at Forest Hills Cemetery, a beautiful cemetery in Jamaica Plain, a neighborhood of Boston. I previously shared her gravestone. Her death notice indicates that her funeral was held at the home at 81 Pinckney. I think this person must be related to "Great Aunt Lukey" (not sure of the spelling), who lived on Beacon Hill. She was still alive in the late 1950s. She was my mother Sally Lowell Whitcomb's great aunt. The family lore says that Great Aunt Lukey went to Bronson Alcott's school, who was some kind of an uncle to her. Read about Great Aunt Lukie at Aunt Lukie, Part 1 and Aunt Lukie, Part 2. My mother has many stories about her! I have read your hilarious post! When my mother took her fiancé to visit Aunt Lukie, she demanded that he take her skydiving. So maybe she got a little bit more fun in old age. Or maybe she was prone to hazing. Thanks for your Great Aunt Lukie story. For other family members reading this, be sure to click on the links in the earlier comment to read about this relative.